Here's a nicely-sized weed pot* of Bittersweet, the invasive vine that has taken hold along many roadsides in the northeast, and can be seen climbing all the way to the treetops. It's like the Kudzu of the north. Come fall, many people are happy to harvest lengths of the vine, with its bright yellow and orange berries, to make wreaths. 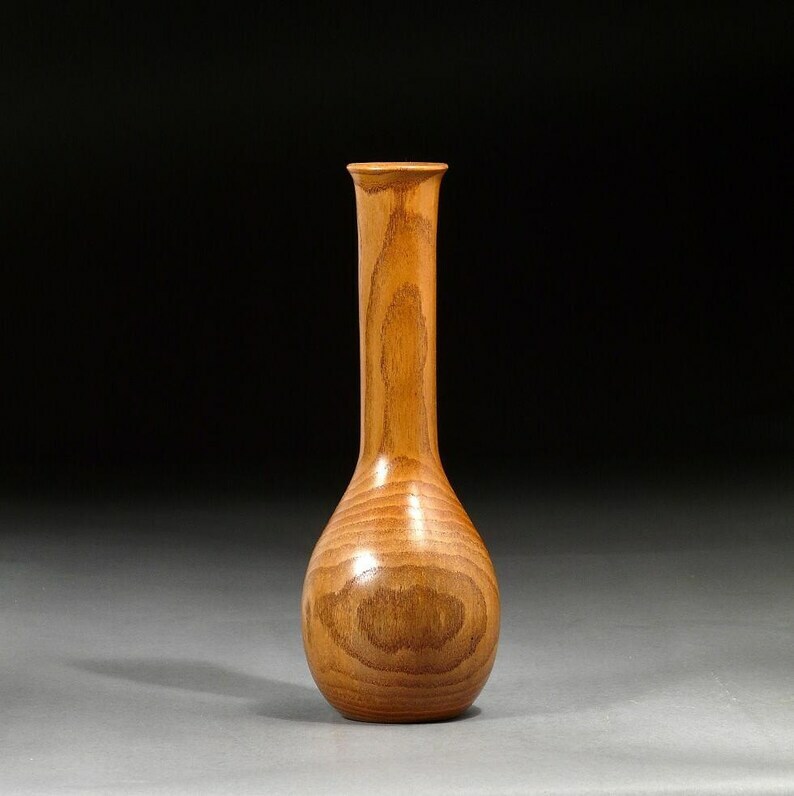 But few have seen the wood of a large, mature vine turned on a lathe into a vase. It makes a very attractive turning, and has been well received by customers. This one was turned from a 5" diameter vine that was slowly killing its host tree. It is 10-3/4 inches tall, and 3-3/4 inches in diameter. After fine sanding, a finish of tung oil varnish was applied, which was then buffed with hard wax to a lustrous satin sheen. Item # BSW98, Oriental Bittersweet Vine Wooden Vase. Buyers outside the USA, please contact me for shipping charges. * A weed pot is a kind of vase made to hold dried weeds, flowers, grasses, seed heads, etc, that you can find in any field, forest edge, or roadside, particularly in the fall. It is not to be filled with water. Nice piece! Beautifully finished! Thank you. Arrived quickly and is so beautiful! The photos don't do it justice. Seems like a great seller. I didn't have much interaction with him but got a nice note of appreciation for the purchase and the piece was packaged with great care. Highly recommended! Etsy Direct checkout preferred; PayPal, checks and money orders also accepted, but please allow time for personal checks to clear. Please contact me if paying by check or money order. If you are not happy with a purchase, you may return the item within two weeks of receiving it for a refund (minus shipping), as long as it is in the same condition as you received it. Return shipping costs will be your responsibility. Please contact me before returning an item. Items are shipped from Massachusetts, USA. I will combine ship multiple items in one box if possible, to save shipping costs. Purchases will be shipped promptly upon receipt of payment (if paying by personal check, I will ship once the check clears). Items will usually be shipped via US Postal Service Priority Mail. Shipments will be insured, with tracking. I occasionally use Standard Post (for large packages) to save you money. I do ship internationally- please contact me for the shipping cost to your country. International shipping can be slow, occasionally several weeks; please be patient. Delays are usually due to the customs agency of the destination country. "Priority International" is the US Postal Service class I recommend, because insurance is available in this class. Tracking is provided. "First Class International" is less expensive than Priority, but insurance is not available; if you choose this class, you will be responsible for loss or damage during shipping. Tracking is provided. International Express shipping is available for an additional charge, but can be costly. If you have a custom piece in mind, please contact me; I'll be glad to discuss it with you. Custom requests will require at least a partial prepayment.